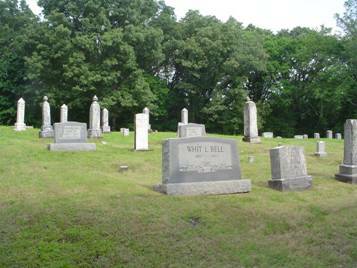 The Bell Cemetery is located to the north of Buffalo River just off Tennessee Highway 13. Travel highway 13 north from Waynesboro for about 12.2 miles. Turn left at the Bell Cemetery sign onto a narrow road and go approximately .1 mile to the cemetery on the left. Bell, Bettie; b. 14 Jul 1881, d. 25 May 1909, wife of W.H. Bell, Carrie; b. 08 Oct 1847, d. 12 Dec 1930, wife of W.L. Bell Sr.
Bell, Jane E. (Meredith)(Williams); b. 28 Mar 1825, d. 16 Jul 1909, daughter of Thomas Meredith, wife of William R. Bell, m: 26 Dec 184? Bell, Joseph R.; b. 30 May 1857, d. 21 Jul 1901, husband of Delphia D.
Bell, Rebecca; b. 14 Sep 1860, d. 16 Nov 1900, wife of T.A. Pope, Rachel L.; b. 26 Dec 1864, d. 12 Mar 1926, wife of J.C.